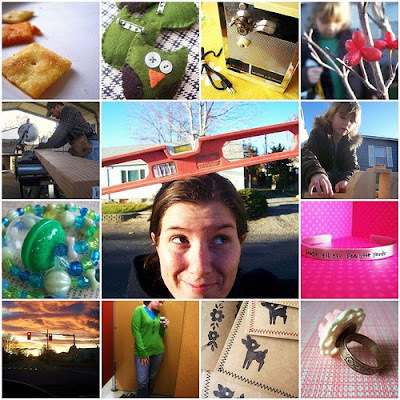 I was really scraping by to get photos for my 'Week in Review' this week. We are doing very well with the packing & I've still got my goal set to be finished by Thanksgiving. That would be TERRIFIC!! I can't believe that in a week there will be a moving van parked out front of our house full of all our stuff-n-things. I've been having so much fun this week collecting all sorts of goodies, doo-dads & surprises to keep Zoey & Pazely entertained on the 3-day trip. They'll each have a shoe box full of happiness. And I'm so excited because while Mr. WhiMSy love & my dad will be traveling in the "Man Van" on our moving adventure, my mom & I are already planning secret side trips while we travel with the girls. This week, it's all about visits with friends, hanging out with family, & last minute things to do. Your side trips sound like they will be fun. Hopefully it will help you and the girls feel a little bit better about moving. And I love the idea of the "man van". I can imagine plenty of manly things going on in there like umm belching and well man things. LOL! Fingers are crossed for you that you can get all packed up before Thanksgiving and can relax and enjoy your last few days.